The Joey and Rory Show Season 2 started airing Jan 4th. The first episode of this season tells the story of how their music career began. New shows air on Friday nights 9pm ET. If you happen to miss Friday night’s show, you can also catch it on Saturday at 7 am ET, Sunday at 9:30 pm ET, Monday at 2 pm ET, and Monday at Midnight ET. FamilyNet is also playing the show. Episodes include plenty of music from Joey+Rory, new stories, new quest artists, new recipes and more, more, more! The show has a down home flavor, and will leave you smiling. Filmed on location in Pottsville, Tennessee, you’ll see where Joey and Rory have been living life, raising kids, and making music. Take a break from your quilting and check out their show. You’ll be glad you did! 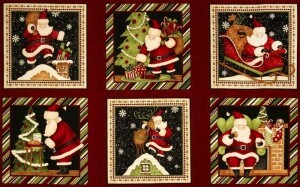 Have you seen any of our Christmas quilt fabric panels, or the coordinating fabrics? 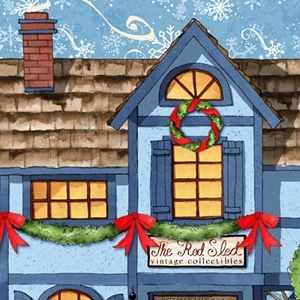 All Around The Town is a collection of five vintage village shops. Each panel piece includes four smaller buildings and one very large building. Of course it’s the quilt shop that is the largest! A 24″ x 43″ panel of Rooftop Santas enjoying different aspects of his job. Any one of these scenes would make a nice little mini quilt all on its own. 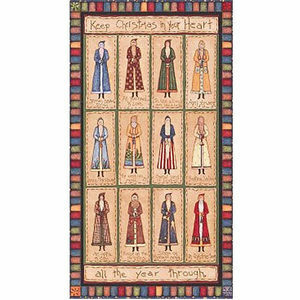 A grouping of mini quilts would look pretty festive. Or you could stack three of them for a small wallhanging. Maybe a pillow or two or three? 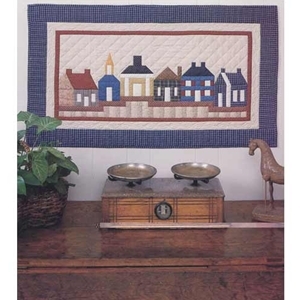 Use a length of 2 panels for a quick lap quilt. Stitch two scenes together and add a handle for a reusable gift bag. Endless possibilities! 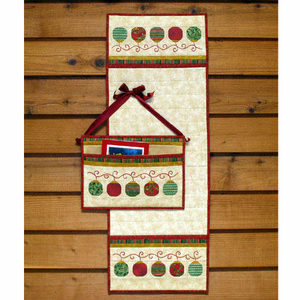 Make a quick, kid-sized, comfy, cheery lap quilt with Christmas Flannel. 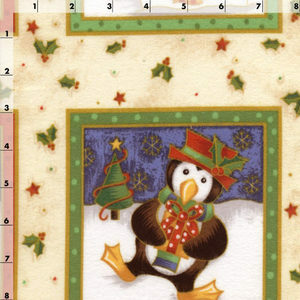 Celebrating penguins in wintry scenes are surrounded by dotty borders. The light colored background is sprinkled with holly and stars. Sandwich, quilt, bind and call it done! 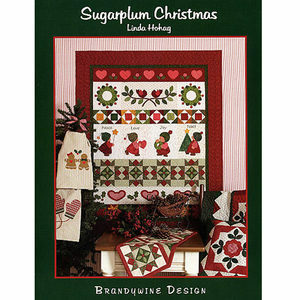 Christmas is fast approaching but, by using panels, there is still plenty of time for Christmas projects! Do you like Pinterest? 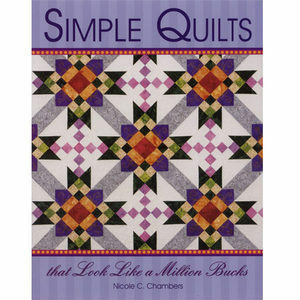 Do you like shopping for quilt patterns? for quilt fabric? for quilting supplies? Do you like prizes? Then have we got news for you! 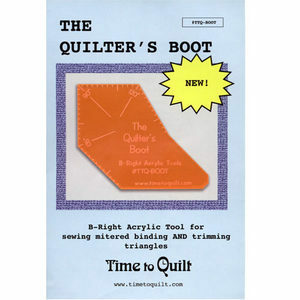 QuiltersWarehouse is running our first Pinterest promotion called “Pinning my next quilt pattern project”. The contest is simple. Start a Pinterest board called “Pinning my next quilt pattern project” and fill it up with whatever you would need to complete that project; pattern, fabric tools, etc. Prizes you ask? There will be a grand prize of a $50 gift certificate to QuiltersWarehouse; 2nd place prize of a $25 certificate and who knows what else may happen. The staff at QuiltersWarehouse will choose the winner. The decision will be based on the pattern chosen, appropriateness of the fabric colors and creativity of the selected pin board. Bottom line, it’s a totally subjective contest on both your part and that of our judges. So with that in mind, we expect everyone to have fun with this; no sore pinners are allowed! What is Pinterest? If your are unfamiliar with Pinterest, it is a social media site that allows you to find and post interesting and inspiring things. It’s basically a virtual bulletin board that you can share with friends, family and the world! Don’t Forget: Send the link to the finished boards to service@quilterswarehouse.com and have fun pinning your way to your next quilt project! Do you need a few more Easter decorations? Here’s a few patterns…. 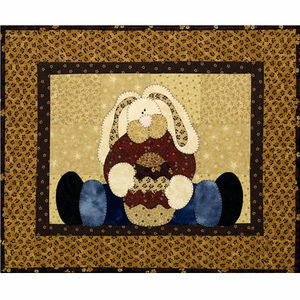 One of The Wooden Bear’s Straddling series, Straddling Bunny is a fun applique project. The instructions are clear and all the pattern pieces are full size. This is easy enough even for a first applique project. And it’s so cute when it’s finished! Isn’t he adorable?! 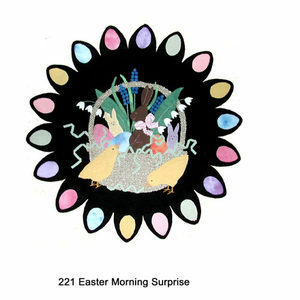 Easter Morning Surprise is a penny rug design by Bonnie Sullivan of All Through the Night. Pastel colored eggs surround a basket full of Easter candy and flowers. A few strands of squiggley Easter grass are spilling out of the basket and a couple chicks are in the foreground. 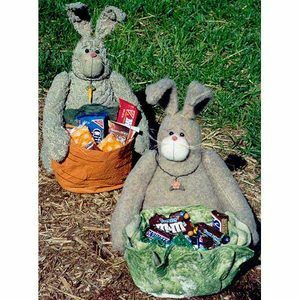 The little ones in your life will love these bunnies holding generous sized baskets. There’s lots of room for goodies! Bunny Stuff would also make a great hostess gift. Everyone loves a mug rug. It makes taking a little break extra special. There’s room for your beverage and for a snack. 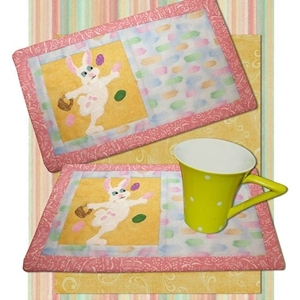 Bunny Snacks pattern measures 6″ x 10″. Make one for yourself and one more for your co-worker. 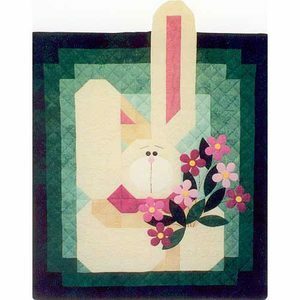 My Bunny Quilt combines piecing and applique for an adorable wall hanging. The pattern calls for button eyes…. you could use colorful buttons for the centers of the flowers, too. Browse the rest of the Easter patterns. Winter will be gone and Easter will be here before you know it. A Quilt Or A Game? Next time you make a quilt for a child, consider making a game too! P is for Play includes instructions for games pieces and a soft die. A soft quilt to sleep under but first play a quiet, educational game all about the alphabet. Just the right kind of slow-me-down, relaxing game . . . the next best thing to reading before bedtime. Now little girls (and boys) can play a favorite sidewalk game indoors with the Hopscotch Mat. Chalk hopscotch was never this colorful! Roll up the mat and take the game anywhere. Sew a few washers inside fabric pieces for “stones”. Checker Game Twin Size quilt will lend a playful look to any bedroom. Or spread it on the floor and play a really large size game of checkers, with room at each end of the playing board for the players to sit on the quilt. Make checker pieces from leftover fabric and a coordinating pouch to hold them when play is over. Just by its design this quilt is visually interesting, but when you “Think Inside The Box” and add novelty fabrics it gets even better. Make pairs of blocks and you can play a matching game. Or make each on different and a game of “I Spy With My Little Eye” is possible. While you can’t really play the games on this quilt, Learn To Play is a fun looking quilt. It would look great hanging on the wall in your family room, or the kids’ playroom. Making quilts is already fun. Make a game quilt and double your fun!